Previously, I wrote an article unveiling some of the most common myths I see in the Local SEO space. I thought I’d do a follow-up that specifically talked about the myths pertaining to citations that I commonly hear from both small business owners and SEOs alike. Myth #1: If your citations don’t include your suite number, you should stop everything you’re doing and fix this ASAP. Truth: Google doesn’t even recognize suite numbers for a whopping majority of Google business listings. Even though you enter a suite number in Google My Business, it doesn’t translate into the “Suite #” field in Google MapMaker — it simply gets eliminated. Google also pays more attention to the location (pin) marker of the business when it comes to determining the actual location and less to the actual words people enter in as the address, as there can be multiple ways to name a street address. Google’s Possum update recently introduced a filter for search queries that is based on location. We’ve seen this has to do with the address itself and how close other businesses in the same industry are to your location. Whether or not you have a suite number in Google My Business has nothing to do with it. In summary, if your citations look great but are missing the suite number, move along. There are most likely more important things you could be spending time on that would actually impact your ranking. Myth #2: Minor differences in your business name in citations are a big deal. Truth: Say your business name is “State Farm: Bob Smith,” yet one citation lists you as “Bob Smith Insurance” and another as “Bob Smith State Farm.” As Mike Blumenthal states: “Put a little trust in the algorithm.” If Google was incapable of realizing that those 3 names are really the same business (especially when their address & phone number are identical), we’d have a big problem on our hands. There would be so many duplicate listings on Google we wouldn’t even begin to be able to keep track. Currently, I only generally see a lot of duplicates if there are major discrepancies in the address and phone number. Myth #3: NAP cleanup should involve fixing your listings on hundreds of sites. Truth: SEO companies use this as a scare tactic, and it works very well. They have a small business pay them for citation cleanup. They’ll do a scan of your incorrect data and send you a list of hundreds of directories that have your information wrong. 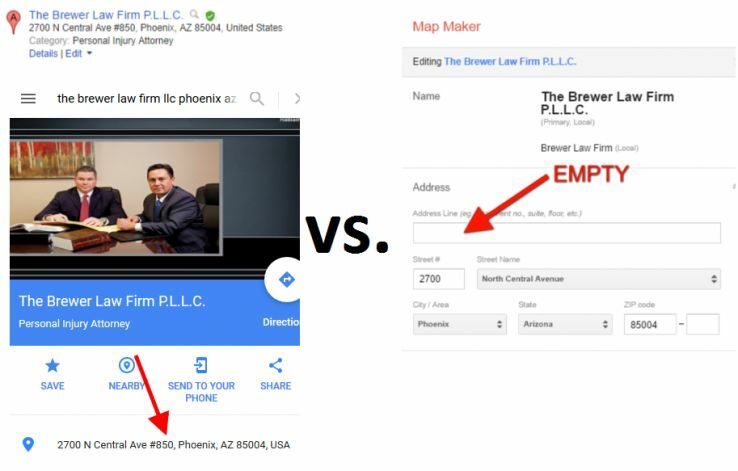 This causes you to gasp and panic and instantly realize you must hire them to spend hours cleaning all this up, as it must be causing the ranking of your listing on Google to tank. If Google hasn’t even indexed the content, it’s a good sign that the content doesn’t mean much and it’s nothing you should stress about. Google would have no incentive or reason to index all these different URLs due to the fact that the content on them is literally the same. Additionally, no one links to them (aside from me in this article, of course). Myth #4: There’s no risk in cancelling an automated citation service. People often wonder what might happen to their NAP issues if they cancel their subscription with a company like Yext or Moz Local. Although these companies don’t do anything to intentionally cause old data to come back, there have been some recent interesting findings around what actually happens when you cancel. Truth: In one case, Phil Rozek did a little case study for a business that had to cancel Moz Local recently. The good news is that although staying with them is generally a good decision, this business didn’t seem to have any major issues after cancelling. Nyagoslav Zhekov just recently published a study on cancelling Yext and concluded that most of the listings either disappear or revert back to their previous incorrect state after cancelling. It seems that Yext acts as a sort of cover on top of the listing, and once Yext is cancelled, that cover is removed. So, there does seem to be some risk with cancelling Yext. In summary, there is definitely a risk when you decide to cancel an ongoing automated service that was previously in place to correct your citations. It’s important for people to realize that if they decide to do this, they might want to budget for some manual citation building/cleanup in case any issues arise. Myth #5: Citation building is the only type of link building strategy you need to succeed at Local SEO. Many Local SEO companies have the impression that citation building is the only type of backlinking strategy needed for small businesses to rank well in the 3-pack. According to this survey that Bright Local did, 72% of Local SEOs use citation building as a way of building links. Truth: Local SEO Guide found in their Local Search Ranking Factors study that although citations are important, if that’s the only backlinking strategy you’re using, you’re most likely not going to rank well in competitive markets. They found also found that links are the key competitive differentiator even when it comes to Google My Business Rankings. So if you’re in a competitive industry or market and want to dominate the 3-pack, you need to look into additional backlinking strategies over and above citations. Myth #6: Citations for unrelated industries should be ignored if they share the same phone number. This was a question that has come up a number of times with our team. If you have a restaurant that once had a phone number but then closes its doors, and a new law firm opens up down the street and gets assigned that phone number, should the lawyer worry about all the listings that exist for the restaurant (since they’re in different industries)? He also pointed out that users finding the phone number for the restaurant and calling it continually would be a negative experience for both the customer and the law firm (who would have to continually confirm they’re not a restaurant) so there would be added benefit in getting these listings for the restaurant marked closed or removed. Myth #7: Google My Business is a citation. Hopefully that lays some of the fears and myths around citations to rest. If you have questions or ideas of other myths on this topic, we’d love to hear about it in the comments!